This past weekend marked the end of this year racing season for me and I finished it with a small little race, The Dirty Girl. 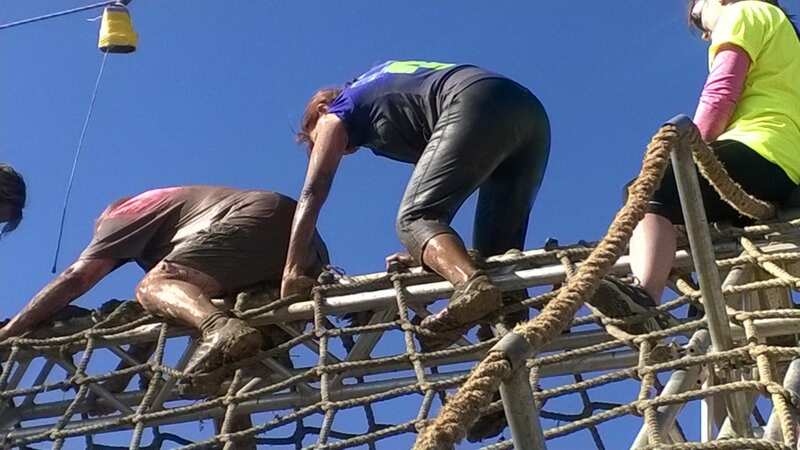 I had done this race a couple of years earlier and this is one of those I called a startup race and perfect for those who just want a taste of obstacle racing. This event took place in Erie, Colorado at the Recess Factory. This was a flat, bumpy corn field course, where even though it wasn't an obstacle you had to dodge prairie dog barrows. It was a beautiful clear day in Colorado with temperatures in the 70’s. One of the things that I really like to have is a confirmation email from the race with your reminders. Dirty Girl did not provide that and I just had to go back on line and print my “ticket” for registration. Packet pick up was very easy as was shirt pick up. We received a t shirt and a bib. I do not know why the safety pins were at another table but maybe that was to avoid congestion at check in? You had to go past the start line to get your packet in the festival area. Plus for Dirty Girl, even though parking was $10 it was close enough you did not need to bag check but that was free anyway. 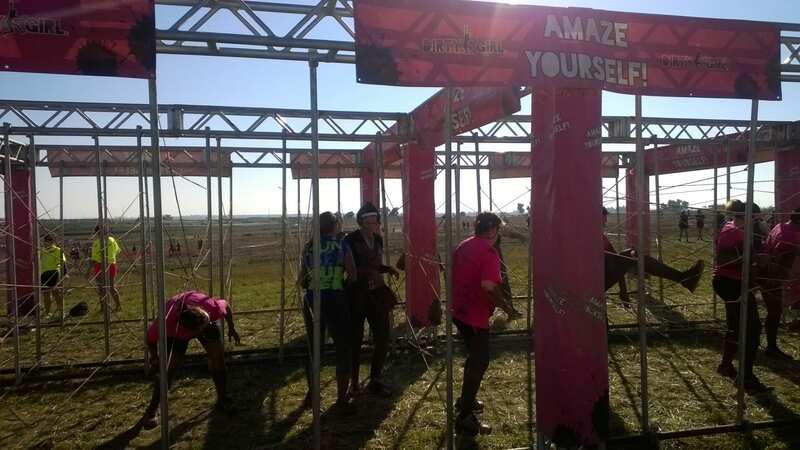 As I said this was a small women’s only race and there were many who had never done an obstacle race before. The women came in all different abilities and shapes and sizes from sisters, to moms and daughters, to friends dressed in matching t shirts. While this to me is a fun run and is not competitive it is for a great cause, Breast and Ovarian cancer. I always like to have some of these to do and this was a great one to end the season. 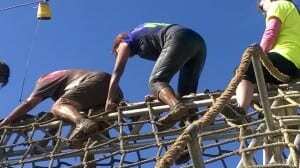 There were 13 obstacles in this 3.1 (5K) mile obstacle/mud run. Our very first obstacle was those inflatable pools with mud in that you had to run through. As I said this was a cornfield, so there was lots of stuff that got in your shoes. There were actually 5 more mud pits with different variations to get through, some we had to actually crawl through and others you could just duck under. We had a spider web with the bungee cords. 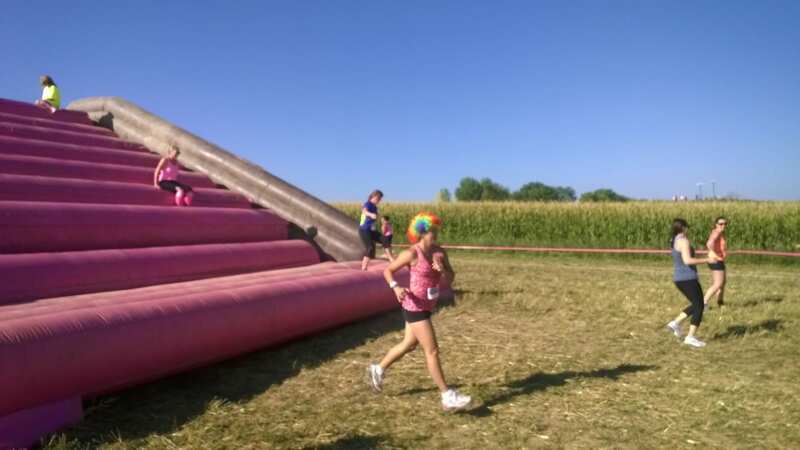 We had this enormous pink bouncy stair thing we had to climb up and then climb back down. I haven’t seen that before, but I was careful on that as you could have fallen through the dividers and twisted your ankle. Chris called me a wimp when he saw me go through that obstacle. We had an A frame cargo net where one women next to me said she couldn't do it. I helped her get over it and all I really did was tell her she could do it and I was right there. Sometimes that little bit is all a person needs to do something. We also had a horizontal cargo net which I just rolled and got to the other side. There also was a giant slide, my own nemesis. I do not like them and the bottom of this was shallow. So not my favorite thing to do. We also had a long tunnel to crawl through but with enough water in that I was able to swim it. The very best obstacle was at the end when we had to run through the last mud pit. 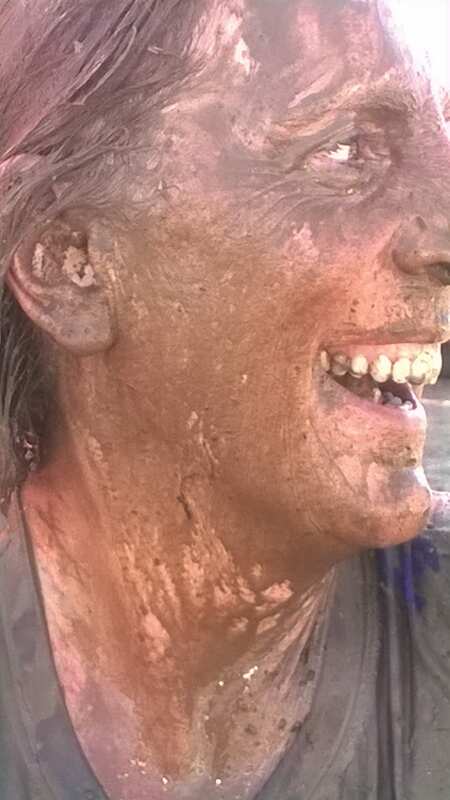 They had 2 volunteers who had pitchers of mud to throw on us, waiting in the giant pool of mud. Since this was my last race, I wrested with my volunteer and we both went down in the mud. That was actually quite fun and she was a really good sport about it. Photographs were taken on the course but have not seen yet as Chris took a bunch on course as he followed me. The festival area was actually quite big and there was a rinse off platform and a changing area. There also was a free comb out and braiding hosted by Paul Mitchell. Another fun little obstacle race. A good one to get you started. This one was a bit steep at the end price wise as it went from $45 to $95. I would give this a 3.5 . 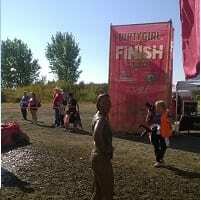 Did you do the Colorado Dirty Girl Mud Run? Share your own rating & review about the event today!